Moshe Denburg’s “Ani Ma-Amin” and Farshid Samandari’s “Asheghaneh” might seem odd bedfellows. Brought together in this profound performance, however, they prove mutually illuminating. The starting point of the programme is really Moshe Denburg’s adaptation of a messianic credo after the mystic Moses Maimonides (1135-1204). Denburg’s piece is based on an abstract from the mystic’s 12th Principle of Faith and becomes an imaginative touchstone for what is to follow, namely Samandari’s “Asheghaneh”. Even though there is no direct link between the two pieces, it is the ecstatic nature of both pieces – messianic and Sufist – that forms a common thread and an inspirational legacy for other composers should they be so inclined and so bold to put such inspirational music down on paper. The Vancouver Inter-Cultural Orchestra directed by Mark Armanini is a world-class ensemble. 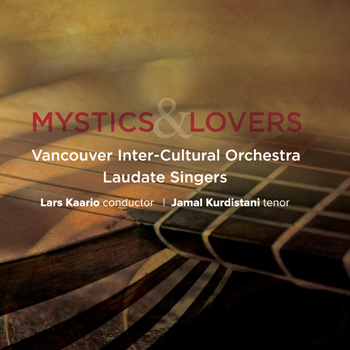 Moreover the soloist, tenor Jamal Kurdistani, reveals himself here as an artist of the first order especially working out of the niche of Persian/Kurdish/Armenian Sufi tradition. So do not expect aria-like repertory with its attendant melisma and coloratura. However, within the realm of quasi-sacred recitatives his instrument is gorgeous: lustrous, precise and feather-light. His musicianship is fierce as he digs into the expression of each word, brings ceaseless variety to soft dynamics and gives every phrase grace. Kurdistani is accompanied by an unique orchestra for this fascinating work and clearly Mark Armanini has inspired his players to great heights to join their soloist. There is something more than purely the messianic that spurs Moshe Denburg, founder of the Vancouver Inter-Cultural Orchestra and that is his seemingly avowed belief in the interconnectedness of all things. As a result Denburg’s composition blooms spring-like at the hands of the Laudate Singers, directed by Lars Kaario, and he brings a deeply interiorized reading to “”Ani Ma-Amin” that inspires the Laudate Singers to take Denburg’s piece to a whole new level. The sweetness of blend among the singers, balanced between the lightness of sopranos, the innate beauty of the altos, and the extraordinarily expressive tenors and heavier bass timbres. All of this makes for a benchmark performance by the iconic voicestra. The melancholy of the performance during the second half of the disc gets a bit much in “a nighttime agony”, the second movement of Samandari’s work, but the following, final movement gains depth from this treatment, and so a modicum of levity – albeit muted – is maintained towards the end of the disc. It bears mention, however, that the artists make all of this music say something entirely new. By any measure, that’s great music making.